Automating Mouse Clicking in Games can be really helpful and handy when you have to do lots of Clicking. Lots of Online and Desktop Games require you to click at a single or multiple screen locations. Instead of straining your fingers to do fast clicking with physical Mouse with the help of Jitter or Butterfly clicking which is not good for hands. Yes lots of Gamers around the globe still do use Software Applications to do the Automated Clicking and enjoy the Game. This post talks about a Mouse Clicking Software Application titled Auto Clicker which is a power packed, simple and yet advanced Automated Mouse Clicking Application. To Automate Mouse Clicking in Games, you can use the Software displayed above and play your favorite Game. 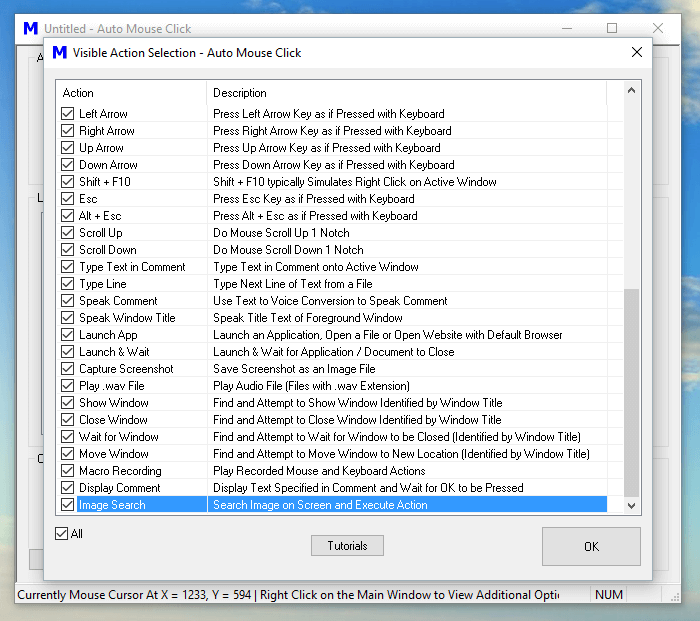 The above Screenshot displays main screen of the the Mouse Clicking Application captured on a Windows 10 Computer. Note that there basically 3 ways in which you can Start / Stop Automated Mouse Clicking in a Game. Define a Keyboard Shortcut to Start / Stop Automated Mouse Clicking. Use Mouse Shortcut to to Start / Stop Automated Mouse Clicking. Click in the Start Clicking / Stop Clicking button to control Automated Mouse Clicking. Variable Mouse Clicking Speed controllable with Random Time Delay. Fixed Mouse Clicking Speed Controllable with Time Delay between Automated Clicks. The Fixed Time Delay between Automated Mouse Clicks is configurable from the Main Screen of Auto Clicker itself, however to add Random Time Delay between Automated Mouse Clicking, click on the Extra Random Delay button and define the limit of Random Duration to be added to the Fixed Time Delay. The Extra Random Time Delay once enabled and configured would instruct this Mouse Clicking Application to do Mouse Clicking like a Human would do. Effectively the Game or Application on which this Application is clicking would receive Mouse Clicks at Random Intervals. The Automated Mouse Clicking can be done at a Fixed Screen Location or at Current Mouse Cursor Position. By default the Automated Mouse Clicking is done wherever Mouse Cursor is present. In case you want the Mouse Clicking to be done at a pre-defined Screen Location, you need to change the Clicking Location as displayed in the screenshot below. 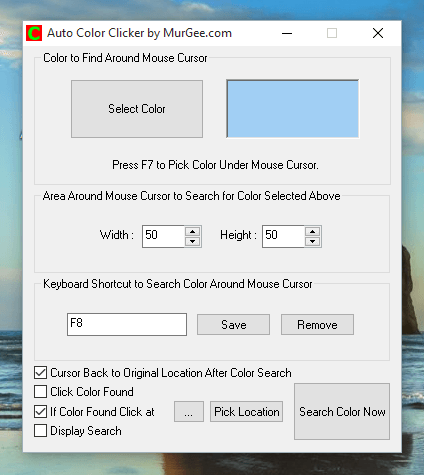 As displayed in the above Screenshot, when Automating Mouse Clicking at Fixed Screen Location, you can even instruct this Software to bring Mouse Cursor Back to it’s original Mouse Cursor Location Automatically as well. Note that you can use the Pick Location button to define the screen location on which you want the Automated Mouse Clicks to be done. One of the really useful feature of this Automated Mouse Clicking Application is that you can launch Multiple instances of the Auto Clicker. This can be useful when you want to have multiple keyboard / mouse shortcuts to Automate Mouse Clicking with different parameters. By default only Single Instance of this Application can be launched. In case the Application is already running in System Tray or it is minimized, double clicking on the Desktop Shortcut would show the hidden / minimized Application and would not launch another instance of the application. In case you have enabled Multiple Instances, you can launch Multiple Auto Clickers by clicking on the Shortcut in Programs Menu or by Double Clicking on the Desktop Shortcut. Each instance when launched creates it’s own System Tray / Notification Tray Icon so that you can control them. Moving Mouse on any of the System Tray / Notification Icon displays the parameters configured for that instance as displayed in the screenshot below. You can Right Click on any of the Icon in Notification Area to view available options and extra features. You can change setting of individual Auto Clicker Instance or you can simply double click on any of the icon to show that particular instance of Auto Clicker. There is another Right Click Menu available which allows you to launch and configure Advanced Options of this Auto Clicker. You can launch the other Right Click Menu by doing Right Click on the main screen of the Software. Yes there are tons of features which ensures that you can Automate Mouse Clicking in DirectX and other MMPORG Games. Once you have mastered basic features of this Mouse Clicking Utility, you can go ahead and explore other advanced features of the Software. In order to get started, right click on the main screen of the software to view a Menu offering Advanced Mouse Clicking features. All the Advanced Mouse Clicking features have been designed taking into consideration the needs of Gamers exploring Single or Multi Player Games. 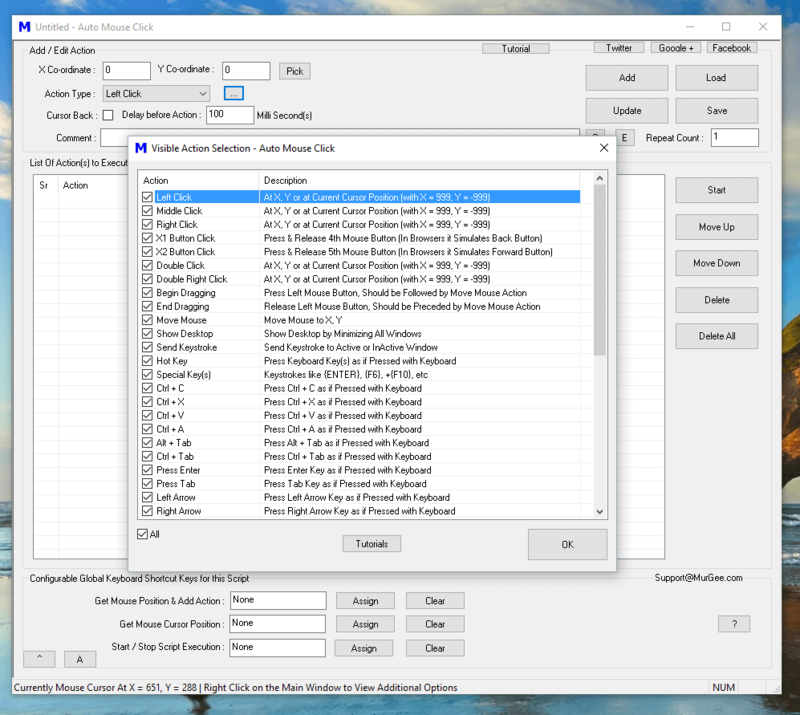 As displayed in the screenshot above, the Right Click Menu offers lots of features which make sure that you can do much more than simple Automated Mouse Clicking at current mouse cursor location or at fixed screen location. Given below are few of the features of Auto Clicker which makes it a simple and yet Advanced Mouse Clicking Application. Feel free to explore various features or just press F1 to view Video Tutorials and help regarding Advanced capabilities of the software. In-built Key Presser to press a Keyboard Key with configurable speed. 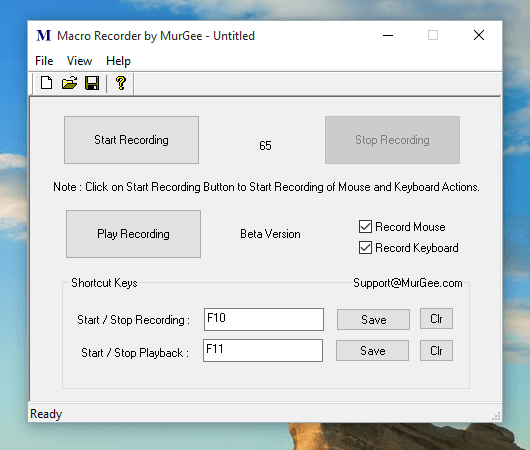 Macro Recorder to record Mouse and Keyboard and then playback the Macro Recording with a Keyboard Shortcut. Game Clicker for Full Screen Games allow you to Automate Fast Mouse Clicking in DirectX based Full Screen Games including MMPORG Games. Fixed Point Clicker to Click at Fixed Screen Location controllable with Keyboard Shortcut. Color Clicker to click on Screen Location identified by Pixel Color. The Click at Multiple Spots menu launches an Application which allows you to Click Multiple Screen Location controllable with single Keyboard Shortcut. The Advanced Menu launches an Application allowing you to Click Multiple Times at any defined Screen Location and is controllable with a Keyboard Shortcut. Change Color Menu allows you to change the Color of the Software. Icon in Notification Area can be changed to any .ico file allowing you to distinguish between multiple instances of Applications running. Extra Random Distance menu allows you to click at random Screen Location. When the Software is doing Automated Clicking, the Mouse cursor changes it’s shape so that you are aware that Automated Clicking is enabled and Automated Mouse Clicks are being performed. Copy Screenshot to Clipboard allows you to capture a Screenshot of the software which you can paste in any Rich Text Application like EMail, Word, etc. The Video Tutorials Menu opens up a web page providing Help and Video Tutorials with which you can learn how to use various features of the software. Remote Control Menu allows you to control Automated Mouse Clicking with a Windows Mobile Phone. Support for Android devices is being developed and will be added soon. In order to enjoy all the features of this Software, Download this Mouse Clicking Application and enjoy all the features of the Software in Online or Desktop Games. This Application works on all recent Windows Operating Systems like Windows 7, Windows 8, Windows 8.1 and even on Windows 10. Yes, this Mouse Click Automation Application has been tested with lots of Antiviruses and totally Virus Free. The Free Trial version of this Software is fully functional and there is no functionality limitation in the software. 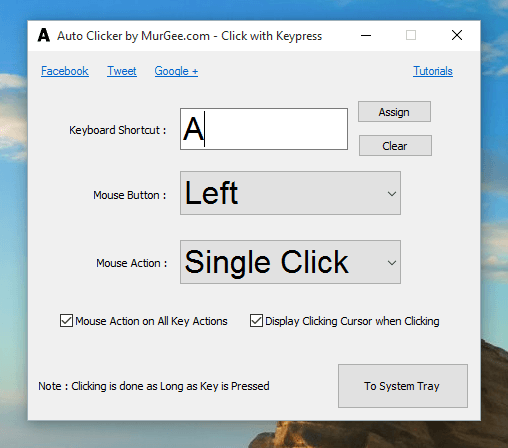 Apart from Automated Mouse Clicking in Games, you can use this Auto Clicker Software to Automate Mouse Clicking wherever you need to spend time and efforts in Clicking repetitively. When you want to Auto Click on Moving objects in Games or other Applications, you can use the Windows Automation Software presented here to Automate Clicking. All you need to do is define the object , sprite or button, define the Search Area and the Software presented here will automatically find it and click on it. 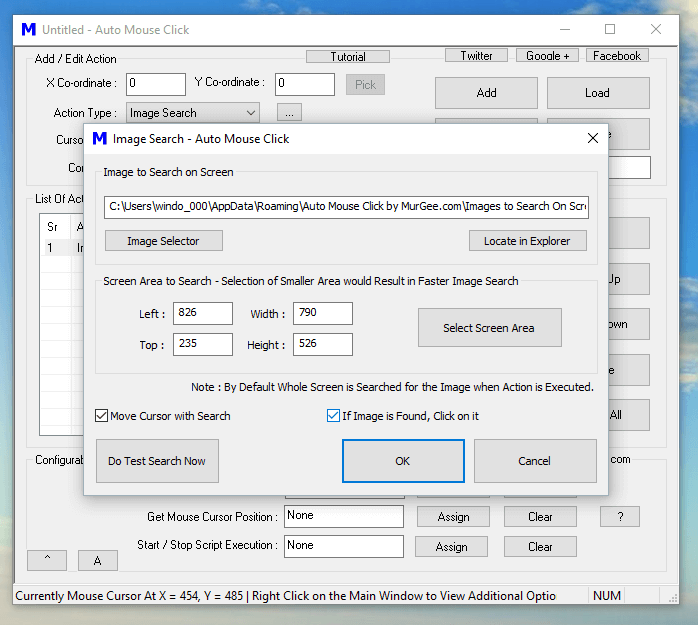 The Image Search Action in Auto Mouse Click is a versatile and useful Action which can be used for Automating Windows with the help of Mouse Clicking, Automatic Text Typing, Key Pressing and now supports Image Search. As displayed in the Screenshot above, the Image Search Action has been configured to look for an Image / Picture on the Screen in a rectangular Area. In case the Picture to search on the Screen is found, a Left Mouse Click is done on the Picture / Button found. Note that the Action has been configured to Move Mouse Cursor automatically with the search so that you can visually see how the Automated Image Search is done by this Windows Automation Software. The Picture to Search on Screen can be selected from the Image Search Action Screen itself. Note that you need to enable the Image Search Action from the list of available actions. One important thing to note is when doing Picture Search on the Screen, the Software scans every pixel on the Screen (in the defined rectangular area) and hence the smaller the search area, the faster any Moving Object can be detected by the Software. While the Picture Search is being conducted, the Software remains Non-Responding and hence make sure define Scan / Search Area on Screen with minimum possible width and height. Yes there are lots of other Windows Automation Actions available in the Software which together makes this easy to use Windows Automation Software a really powerful tool. All you need to do is Add the required Actions in the Script and execute the Script. Note that all the Actions are executed in order and hence the number 1 Action will be executed first, then number 2 action and so on. In case you have configured the Image Search Action to move Mouse Cursor with the Picture Search, the Mouse Cursor will stop at the last Pixel of the Screen Search Area. Now Clicking Moving Objects is really easy and fun and works well with all Games and other Windows Applications. The Speed of Picture Search depends on the speed of your Computer and available resources like Memory, CPU Processing power, etc. Our brain is much faster in recognizing Moving Objects on Screen, however the Computer requires to scan each and every pixel and match all the pixels in the Picture to be Searched from the pixels on the Screen. With Appropriate planning, you can easily create a Picture Clicker, Screen Clicker, Automated Mouse Clicker or a Key Pressing Bot with this unique and useful Windows Automation Tool. Blocking Website on a Windows Computer is now really easy with Block Website Software. The best part of using this Website Blocking Software is that once you have blocked desired Website(s), you can close the software and the Blocked Website remains blocked from all Software Applications and Browsers. Whether you are using a Windows 10 Computer, or a computer running Windows 8.1, Windows 7 or even Windows 2000, you can simply use this Website Blocking Software to Block as many websites yo want. The list of websites blocked by this software is automatically backed up whenever new changes are made to the list of blocked websites. You would need Admin Rights to your Windows Computer in order to Block any number of Websites with Block Website Software Application. Whether you are using a 32 bit Windows Computer or a 64 bit Windows Computer, this Website Blocking Software Application works on all Windows Versions. The Block Website Software Application works by editing hosts file on a Windows Computer. You can even Map any Domain name to any desired IP Address with this unique and easy to use Software Application. Blocking a Website with the help of this Software requires you to Add a new entry and then finally clicking on Save Changes. Many times Blocking a Website at Workplace is required to make sure employees or other people having access to the computer, do not waste time and efforts on non-productive activities. Blocking single or Multiple Websites is also easy and quick way to keep your Windows Computer safe from Malware and Viruses. Download Free trial of Block Website Software, Install it on your Computer and Block any number of Websites on your Windows Computer. Let your Computer do Repetitive Tasks with the help of a simple and easy to use Software Utility. The Windows Automation Application presented here can do almost everything including Mouse Clicking, Moving Mouse, Dragging Mouse, Pressing Keys and much more. Yes you can use this Windows Automation Software on Windows 10, Windows 8.1, Windows 7 and other Windows Versions. You can Download this Software for Free, create a Macro Script to Automate Repetitive Task to save time, efforts and money. The Main Application Window as displayed in the screenshot above is re-sizable and can be moved around by dragging from the title bar of the software. There are lots of features in the software displayed on the main screen and some of the features are available from the Right Click Menu of the Software. There are advanced features available from the System Menu of the software as well. Download and try this Windows Automation Utility from the link above to Automate Mouse Clicking, Key Pressing and much more without doing any coding. When you have more than 1 devices connected to same Network, you can Remote Control any device without Internet. With the help of Teamviewer, you can Remote Control your Devices on Intranet and as well as on Internet. Using Intranet allows you faster control as your Internet Connection is not used. Here in this post, a Windows Computer is connected to LAN with cable and and Android Device is connected to the same network with the help of Wifi. Controlling an Android Device from your Windows, Linux or Macintosh Computer without Internet is possible using this method. All you need to do is install Teamviewer QuickSupport on your Android Device as displayed in the screenshot above.Once you have the above mentioned Remote Control App installed, Open it and depending on the Manufacturer of your Android Device, you will be prompted to download an Add-On, Download it and Install it. Yes now you are ready to control your Android Device from your Windows, Macintosh or even a Linux Computer by installing Teamviewer on your Desktop Computer. Now once you are done with Installation of Teamviewer on your Android and on your Desktop Computer, connect your both Devices to the same Network. Start the Remote Control App on your Android Device to view your Identifier as displayed in the screenshot below. Note that there is no password and you would be required to Tap manually on your Android Device to grant permission to allow Remote Control of your Android Phone or Tablet. Now launch Teamviewer on your Windows, Macintosh or Linux Computer and connect to the Remote Control Identifier on your Android Screen. The given below Screenshot has been captured on a Windows Computer and the Remote Control ID from Android Mobile has been entered on the Software running on the Windows Computer. Yes you are ready to go and Teamviewer itself will automatically detect that your both Android and Desktop Computer are connected to same Network and will not use Internet Connection. Yes you must verify that when Controlling Android Device Remotely, your Internet connection is not used. In order to verify that Internet connection is not used for Remotely Controlling your Android Mobile or Tablet, keep the Wifi Modem or Network Switch switched on, but disconnect Telephone Line cable which brings Internet Connection to your Network. For verification that Remote Controlling Android is not using your Internet connection, opening any website will not be successful and your System Tray will indicate that Internet connectivity is not present. You do not need to actually disable Internet when using Teamviewer to Remote Control your Android Mobile Phone or Tablet provided you are connected to same Network and Teamviewer on Desktop Computer can connect to your Network. In case you are using Wifi to connect to your Network on your Desktop or Laptop Computer, make sure to provide Wifi Password from the Settings. This Tutorial was written with blank Wifi Password and using MAC Filter to control the devices which can connect to Network. Yes all these steps are required to control Android Device without using Internet connection, however once you have setup everything, it is pretty easy. Auto Clicker for Android was created using this method and works well to send automated Taps or Clicks to Android Device. Using this method to control Android Device does not requires you to Root your Android Device and does not requires Internet Connection as well. Rooting Android Phone or Mobile voids your Warranty and can invite lots of problems. This Remote Control method is best way to interact with your Android Device on bigger Desktop or Laptop screen and is really easy and fun way to Control Android Mobile or Tablet without using Internet. Auto Clicker designed specifically for Games is presented in this post. Whether you want to play an Online Game or a Full Graphics enabled Desktop Game powered with Direct X, OpenGL or other technologies, the Auto Clicker presented here works in all Games. 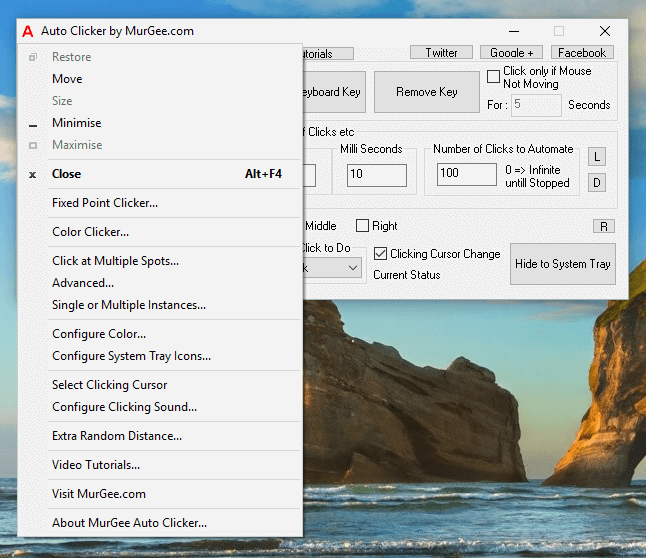 Yes the Auto Clicker works on Windows 10 and other Windows Operating Systems like Windows 8.1, Windows 8, Windows 7, etc. The main screen of Auto Clicker presents few of the commonly used features and other power packed features to do automatic Mouse Clicking are present in right click menu and from System Menu of the software. Lots of Video Tutorials are available so that you can start using the Auto Clicker within no time. 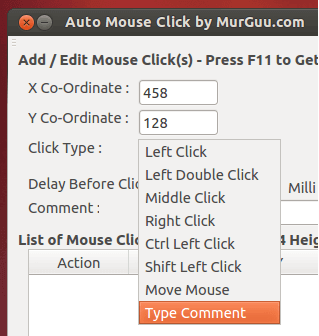 Automated Mouse Clicking of every type is supported by Auto Clicker. 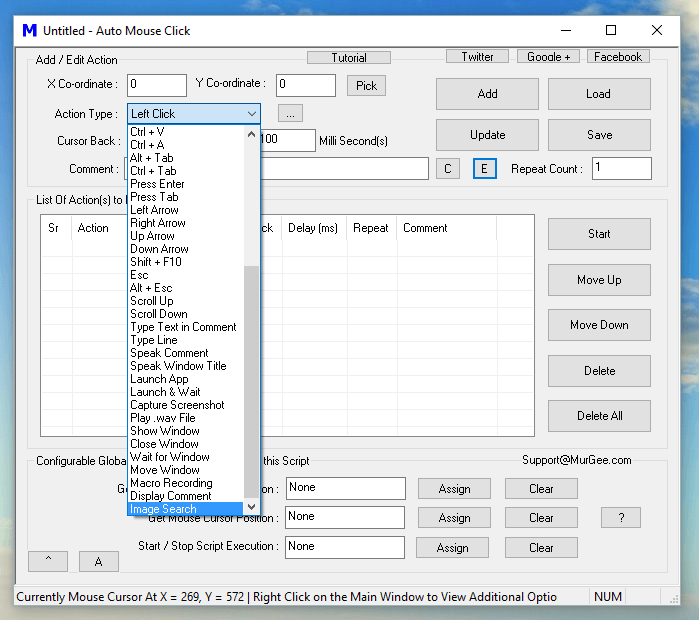 Whether you need to do Automated Mouse Clicking at current Mouse Cursor Location, or at Fixed Screen Location, or even at Random Screen Location, you can setup the Auto Clicker to do Auto Mouse Clicking as you want. 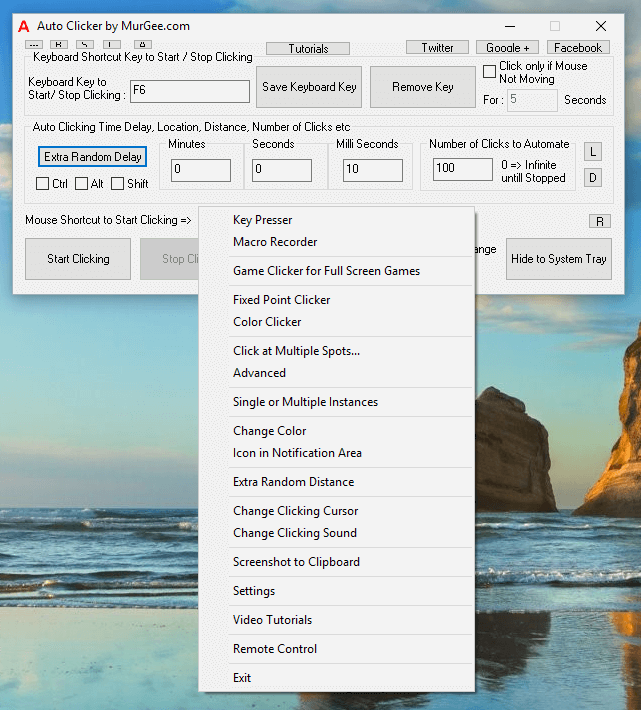 There are basically 4 ways in which you can start / stop Automatic Mouse Clicking done by Auto Clicker. Depending on the Game you are playing, you can select any of the methods described to start / stop automated clicking. Start / Stop Automatic Mouse Clicking with a Configurable Keyboard Shortcut is displayed in the above screenshot where the function Key F7 is assigned to Start / Stop Automatic Mouse Clicking. Once you have assigned a Keyboard Shortcut, you can Minimize the software or hide it to System Tray. Start / Stop Mouse Clicking by physical Mouse Click is a way in which the Automatic Mouse Clicking is started by Auto Clicker when you physically click Mouse Button. This can be really useful when a Game requires pressing of multiple Keyboard Keys and you have any of the Left, Middle or Right Mouse Click buttons free for other purpose. You can also use the Start Clicking button present on the main screen of Auto Clicker to start Automated Clicking and then later Stop Mouse Clicking by clicking on the Stop Clicking button. This option is not very Game Friendly and should be used only when other options to start / stop clicking does not suite your requirements. For Windows Mobile Phone users, the Auto Clicker presents an option to Start / Stop Clicking by tapping on the Windows Mobile Screen using the Auto Clicker Remote. Controlling of Automatic Clicking with Android Phone will be supported soon and is a work under progress. For Clicking on Android Phone instead of your Windows Computer, you can use the procedure described in the Auto Clicker for Android post of this blog which does not requires rooting your Android Phone. 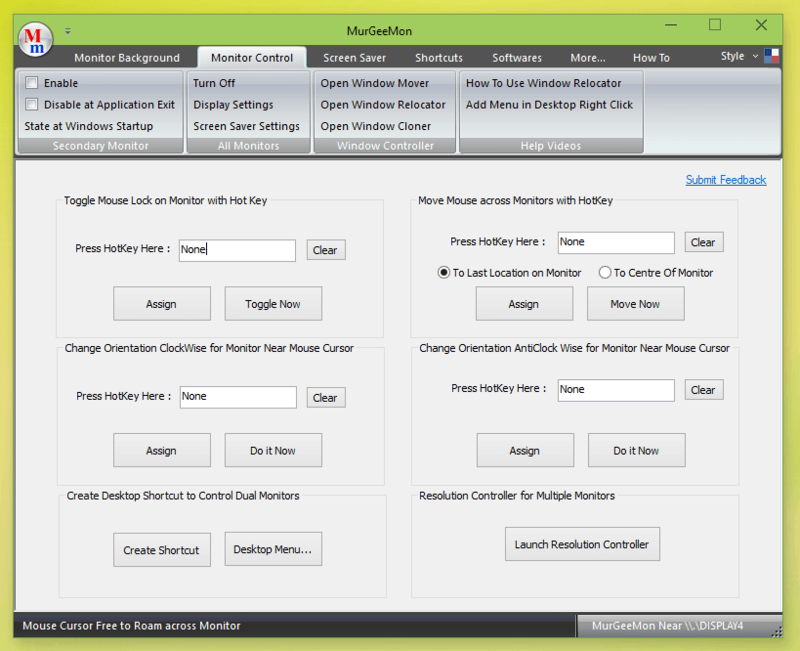 The Tutorials and Screenshots together allow you to discover various features of this Mouse Automation Tool. You can explore various features of the software from the right click menu and displayed in the screenshot below. You can even download and share Video Tutorials of the software from the right click menu of the software. 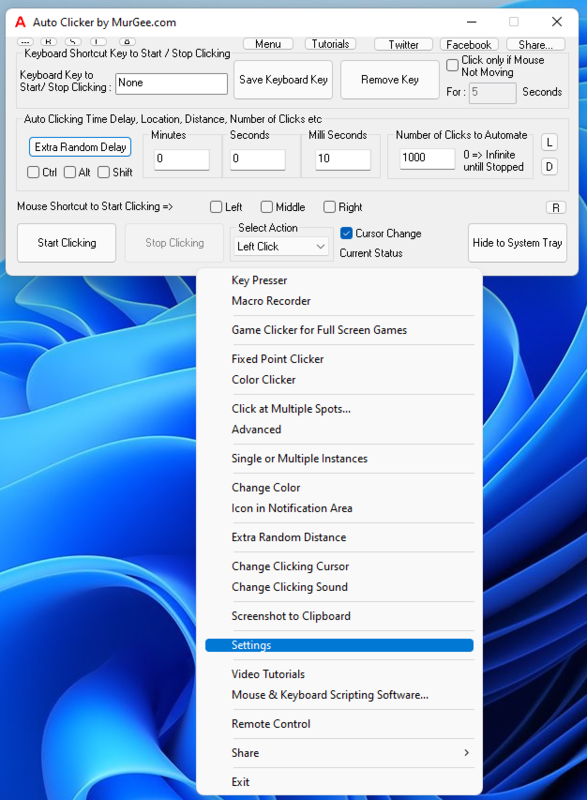 In order to discover features of Auto Clicker which are not visible on the main screen, do a right click on the software and view the available options. There are some features in the System Menu which can be invoked by doing a Left Mouse Click at the top left corner of the Software. Few MMORPG Games block Automated Mouse Clicking and hence a unique and undetectable Auto Clicker has been incorporated titles Game Clicker for Full Screen Games. This feature of Auto Clicker automates Mouse Clicking in every possible game on Internet. Whether the Game is running in Window Mode or in Full Screen Mode using Direct X or any other Gaming Software, this Game Clicker can click everywhere. This Game Clicker feature requires download and installation of extra files as described in Auto Clicker Not Working in Game. The Game Clicker download and usage is Free for Auto Clicker users, however the main Auto Clicker offers much more features regarding location of Mouse Clicking, Speed of Automatic Clicking , etc. As described above there are two ways in which you can Automate Mouse Clicking. 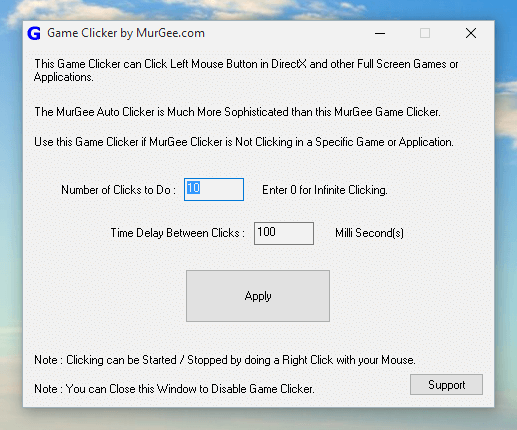 The Game Clicker offers far less control of Automated Clicking, however the Auto Clicker is much more sophisticated and offers super fine control of how you can send Mouse Clicks to Active Game or any other Application. When you install Auto Clicker and opt to have Desktop Shortcut created, you will notice that there are two different shortcuts created on Desktop as displayed in the Screenshot above. The first shortcut launches Auto Clicker using your signed on credentials and launches Auto Clicker so that it can do Automated Clicking on Games which does not require Admin Access. 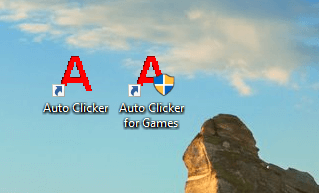 The second Desktop Shortcut titled Auto Clicker for Games allow you to launch Auto Clicker which can send automated Mouse Clicks to any Game or Application launched with Admin Access. This method of launching Auto Clicker should be preferred so that irrespective of Game you are playing, your Auto Clicker can do the Mouse Clicking for you. The Speed at which Mouse Clicking is done by Auto Clicker is configurable from the main screen of the software. Yes location of Automated Mouse Clicking is also configurable and specialized Fixed Point Clicker is available in case you need to have multiple keyboard shortcuts to do Mouse Click at fixed screen location. Speed of Clicking : The Rate at which Mouse Clicking is done by Auto Clicker for Games is configurable by defining the time delay between consecutive mouse clicks. Effectively, if you want a Fast Clicker, you must define low time delay values and if you want Slow Clicker, you must configure a large time delay value. Note in the above screenshot, the time delay defines is for 0 Minutes, 0 Seconds and 0 Milli Seconds which effectively makes this Auto Clicker really the Fastest Mouse Clicker. Note that you can also define Extra Random Time Delay so that the Automated Mouse Clicking sent to the Game is like a Human doing the Mouse Clicking. Location of Clicking : You can either choose to do Automated Mouse Clicking wherever your Mouse Cursor is present or you can specify a Fixed Screen Location. When you select the option to do Mouse Clicking at a Fixed Screen Location, you can optionally instruct the Auto Clicker to return your Mouse Cursor to the original Mouse Cursor Location. Choice is Auto Click location depends on the Game you are playing and you can switch the location anytime from the main screen of the software. Lots of Games require you to Click on Fast Moving Objects / Sprites. Yes the Auto Clicker provides an Automated way of clicking any fast moving object on screen around mouse cursor location with in built Color Clicker. The Automated Mouse Clicking on a specific Color can be done by defining a Keyboard Shortcut and then moving the Mouse Cursor near the object you wish to click and then finally pressing the keyboard shortcut. All the Games have inbuilt Graphic objects, Images or other Animation stuff. When Automating Mouse Clicking onto a fast moving object, you need to find a Color which remains fixed or in other words a Color which is always the part of the Fast Moving Object. Once you have identified the Color, rest all is easy and can let this Color Clicker do the automated Clicking for you. When you need little bit more than Mouse Clicking in a Game, you can use the inbuilt Macro Recorder, Record Mouse and Keyboard Actions and then Replay the Recorded Actions with a Keyboard Shortcut. You can start the Macro Recorder from Right Click Menu of Auto Clicker and use two configurable Keyboard Shortcuts to control the Macro Recorder as displayed in the screenshot below. As displayed in the screenshot above, you can Record Mouse Actions (e.g Mouse Clicking, Mouse Movement, Mouse Scrolling, Mouse Dragging, etc and Record Keyboard Actions (e.g Key Pressing, Key Holding, etc) and 2 Shortcut Keys allow you to Start / Stop macro Recording and to Start / Stop Playback of Recorded Macro. Yes you can even save the Recorded Macro and then load it later for Playback. In case you are going to use the Macro Recorder for Games in a Desktop Game which requires Admin Access, make sure to first launch Auto Clicker for Games and then from the right click menu, do launch Macro Recorder. This method of launching the Macro Recorder will make sure that your Mouse and Keyboard Actions are recorded properly irrespective of the Game you are playing. Note that you have the option to Record Mouse and / or Keyboard Actions. When playing a Game if you have a finger free for holding a Keyboard Key, you can hold a Keyboard Key down and let the Auto Clicker do the clicking for you. Typically in a Game, WASD Keys occupy left hand, whereas the right hand can be used to hold a keyboard key like Page Down, Page Up or any other key which can do the Mouse Clicking for you with the help of latest feature of Auto Clicker for Games. This method of Automated Mouse Clicking in a Game send Mouse Clicks as long as you are holding a Keyboard Key down. Whenever you release the assigned Keyboard Key, the Automated Mouse Clicking will be stopped automatically. The Auto Click by Holding Key provides the procedure of using this functionality and provides the software download link. Yes this feature is Free with Auto Clicker and works on all Windows Operating Systems. There are still many more features in Auto Clicker which can be really useful when playing an Online or Desktop Game. Author feels that Gamers who can play today’s complex Games can easily find the other unexplained features of this software. Do download and try out the software and make sure to send a request to Customer Support, in case you find that any feature can make your Gameplay easier. Using and Managing Dual Monitors with your Windows Computer is now easy and quick. Just having Dual Monitors connected to your Windows Computer is only half the job done. The Software Application presented here lets you have full control over both the Monitors, Application Windows, Mouse Cursor, Wallpaper and everything you want to access when using a Dual Monitor Computer. Whether you are using Windows 7, Windows 8, Windows 8.1 or even Windows 10, the Software Utility presented here is worth giving a try. 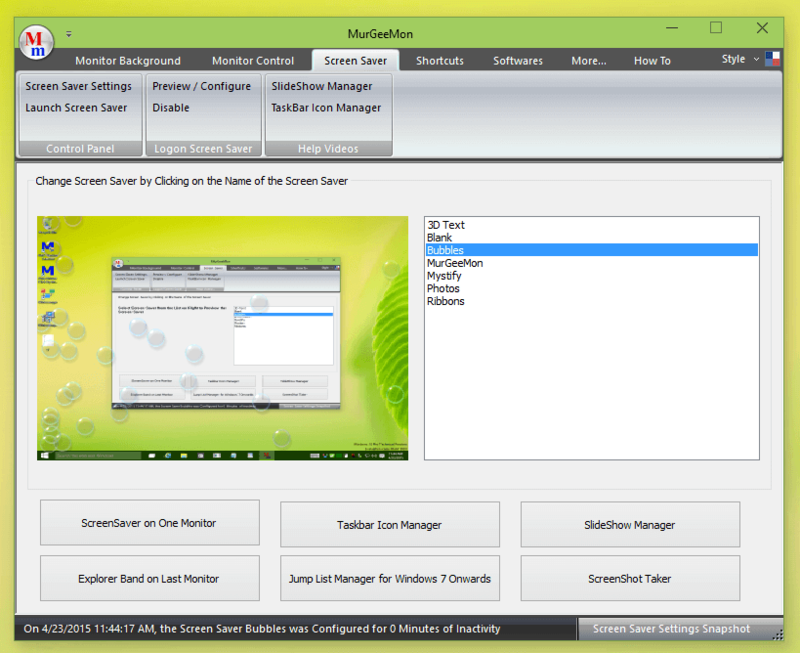 As displayed in the Screenshot above, the main screen of the Dual Monitor Software titled MurGeeMon allows easy navigation between various features of the software. The first tab allows you to configure wallpaper in each monitor easily, allows you to switch between Single or Dual Monitors by either Extending your Screen onto Second Monitor or by Duplicating your first screen on your Second Monitor, etc. 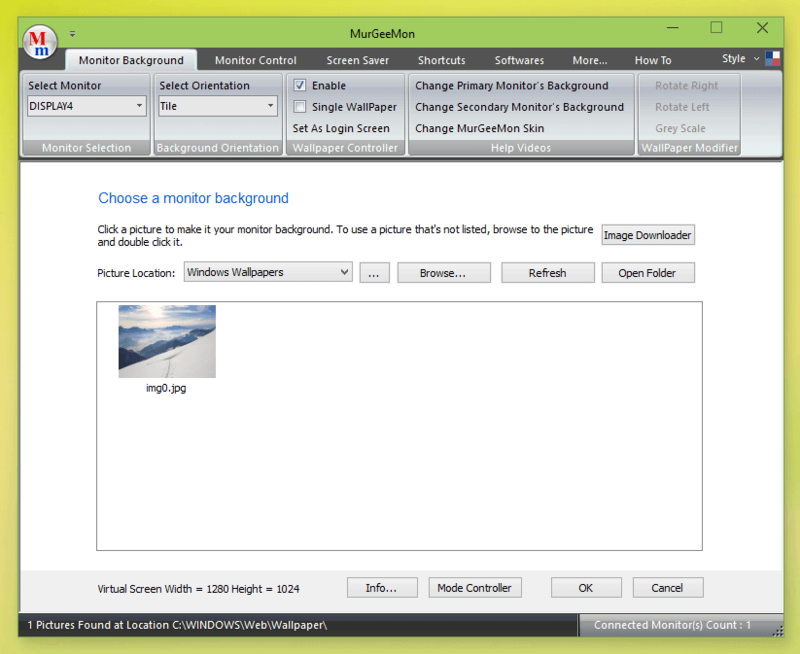 The Monitor Control tab allows you to control Mouse Cursor Movement across Monitors, Change Display Orientation, Move Mouse Cursor across Monitors with Keyboard Shortcut, provides access to Window Cloner, Window Mover and Window Locator. 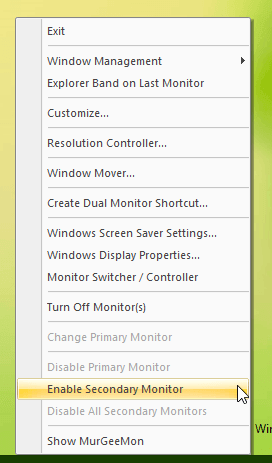 From this Tab, you can also create a Desktop Shortcut useful to control and manage Dual Monitors connected to your Windows Computer. Just explore various features of this tab which offers full control over your Dual Monitors and there are video tutorials available as well. The Screensaver tab of MurGeeMon allows you to change ScreenSaver and buttons at the bottom of the page allows you to control other advanced and useful parameters of your Display. The JumpList Manager allows you to create a Jumplist containing Application or Website Shortcuts. You can even launch ScreenSaver Settings of Windows from this Page and have full control over what and when is displayed on your Screen. Perhaps the Most Powerful and helpful tool of this Dual Monitor Software is it’s System Tray Menu. As displayed in the above Screenshot, the System Tray Menu can be invoked by doing a Right Click on the Software’s Icon in Notification Area. You can Enable or Disable Second Monitor, launch Window Mover, Create a Desktop Shortcut to control Dual Monitors and much more. Download and try out this Free to Download and try Software Application on your Windows Computer. Yes whether you are running 32 bit or 64 bit version of Microsoft Windows, this Software works on both bit architectures of Windows. The Screenshots captured above have been captured on a Windows 10 Computer, however the software works well with Windows 8.1, Windows 8, Windows 7 and other versions of Microsoft Windows. Now you can let your Computer do the Text Typing for you automatically upon receiving keyboard shortcut key. Yes whether you are using Windows, mac or Linux, you can let your Computer do the Repetitive text typing for you. Text Typing Software Applications or otherwise called Auto Typer is presented in this post. Starting with Windows, this post talks about Auto Typer for Mac and then for Linux as well. The above screen displays a popup Menu which has been invoked by pressing a Keyboard Shortcut, allowing you to start automatic typing with active window in focus. The Main Screen of Auto Typer for Windows is as displayed below. It has an inbuilt shortcut text editor allowing you to configure text and keyboard shortcut. Yes you can even configure automatic text typing speed and much more as outlined in the post Text Typing Software on this website. 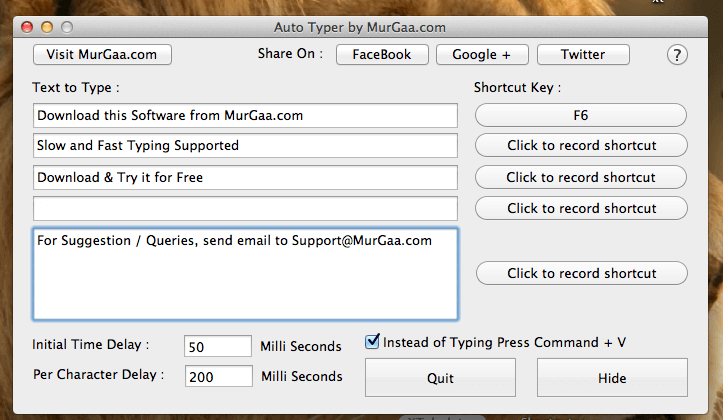 For Macintosh OS X 10.6 and later users, an Auto Typer for Mac is available as well. This Auto Typer provides similar functionality as for the Windows Version. The given below screenshot displays the main screen of Auto Typer for Mac and runs on all the latest Mac OS X Versions such as 10.6, 10.7, 10.8, 10.9 and even on 10.10. 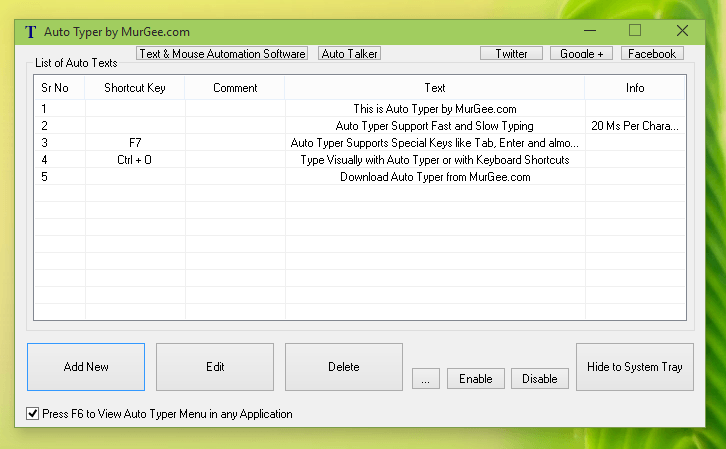 Download the latest version of this Text Typing Software on your Mac OS X and try it for Free. Once you have downloaded the .zip file containing Auto Typer for Mac, just run it and you are ready to use your Mac to do the Automatic Text Typing for you. Yes you can control the speed of Text Typing by adjusting the value of Per Character Delay in Milli-Seconds. Higher the value of per character time delay, slower would be your typing and vice versa. For Linux users, the steps required to setup the Tuto Typer for Linux are bit involved as compared to Windows and Mac Version. As displayed in the screenshot above, you can use the Linux Automation Tool to create single or multiple scripts containing text typing macro action. Apart from adding Text Typing, you can also add Mouse Clicking and other Automation Actions so as to save yourself from doing the same task over and over again. This post talks about how you can build an Auto Clicker for your Mobile Phone or Tablet running a Mobile Operating System like Android, Windows Phone, iPhone or iPad. The Mobile Operating System providers like Google, Microsoft, Apple, etc do not want you to use your Mobile device like Desktop Computers with full Automation Capabilities. All the existing methods of installing Auto Clicker on your Mobile Device require you to Root or Jailbreak your Device. Yes Jailbreaking or Rooting your Mobile Device can brick your device and yes you have to pay for Rooting or Jailbreaking your Device, unless you are ready to risk your device and spend countless hours in finding the appropriate method to Root or Jailbreak your Mobile or Tablet. A Desktop or Laptop Computer running Windows, Macintosh or Linux Computer. A way to transfer Mouse Clicks or Taps to your Mobile Phone or Tablet. Appropriate Auto Clicker to run on your Desktop or Laptop Computer. Once you have assembled all of the above, you are ready to go ahead and send Automated Mouse Clicks, Taps, Text Typing or anything else to your Mobile Device. For Android you can follow the post titled Auto Clicker on Android without Root and the same method is applicable for other Mobile Operating Systems like Windows Phone and iOS. Depending on availability and compatibility the choice of Software to install on your Mobile or Tablet can change. 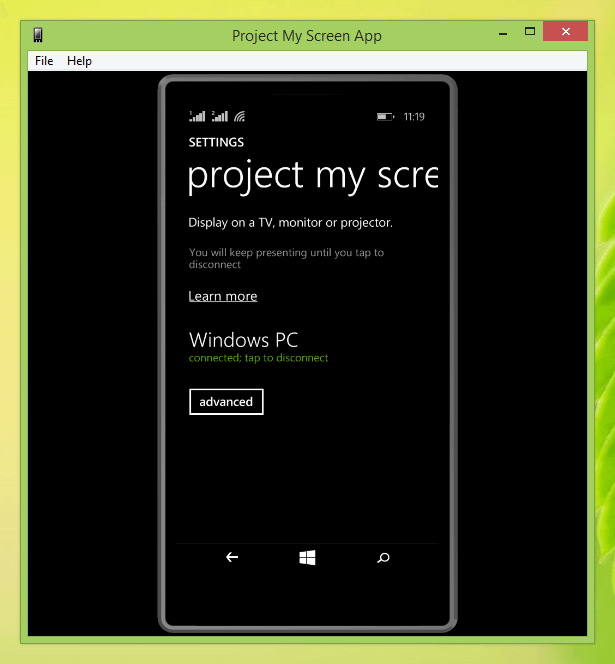 For building an Auto Clicker for Windows Phone, you can use the Project My Screen Software from Microsoft and control your Windows Phone from your Desktop or Laptop Computer. Mobile Phones can also work as Remote Control for Auto Clicker, however Mobile Operating Systems do not allow Automated Clicking by Apps installed due to security & other reasons. For building an Auto Clicker for iOS devices, you can use VNC Viewer or any other appropriate software and use an Auto Clicker which works on your Desktop or Laptop Computer. In case you do have a Windows Computer, you can download the Auto Clicker and let it click for your on your Android, Windows Phone or even on iOS Device with appropriate software to transfer your Automated Clicks from Computer to Mobile Phone or Tablet. Using an Auto Clicker on Android Device is now possible without Rooting your Android Tablet or Mobile Device. Yes you do not need to root your Android in order to Automate your Repetitive tasks. Whether you want to Play Game on your Android which involves lots of clicking or simply automate a group of taps or clicks on your Android, the method describes here works without need to Root your Android. Rooting your Android modifies your Operating System by utilizing a bug in your Android Operating System and yes it also voids warranty of your Android. Although this post talks about using Auto Clicker with your Android Device, you can Automate Typing or anything else on your Android Device with the method described here. You would need a good Internet Connection and access to a Windows Computer in order to build your Auto Clicker for Android without Rooting your Android Mobile or Tablet Device. 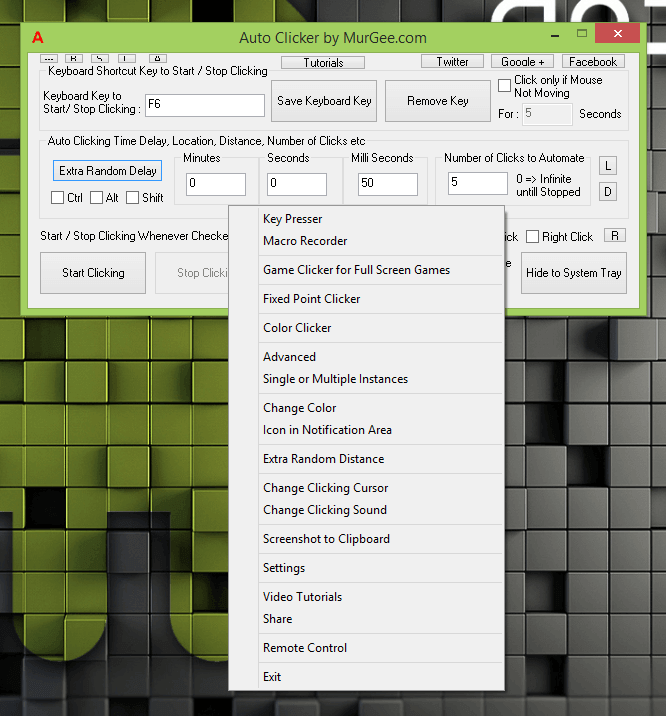 The Auto Clicker as displayed in the screenshot above can be used to Automate Clicking or Tapping at Fixed or Variable Screen location on a Windows Computer. Now in order to send Mouse Clicks or Taps to your Android Device, you need a Software which can transfer Actions done on your Windows Computer to Android and you are ready to use the Auto Clicker with your Android device without Root Access of your Android Device. The above Screenshot displays TeamViewer for Remote Available for Free from Google Play Store which can be used to Transfer Mouse Clicks and other Actions from a Windows Computer to your Non-Rooted Android Device. Apart from installing the TeamViewer for Remote on your Android Device, you might be prompted to install another addon depending on the manufacturer of your Android Device as displayed in the screenshot below for Samsung powered Android Devices. Once you have Teamviewer for Remote installed along with appropriate addon as per your Android Device Manufacturer like Samsung, Lennovo, LG, HP, etc, you are almost ready to go. The best part is that in order to install any of the above mentioned software, you do not need to Root your Android Device. Now the final part remaining is to download & install Teamviewer on your Windows Computer and connect to your Android Device with an Internet Connection. To summarize the steps outlined above, the above mentioned paragraphs have outlined given below steps to get your Auto Clicker working on your Android Device without Root Access. Download & Install Auto Clicker on your Windows Computer. Open Google Play Store on your Android Device and Install Teamviewer for Remote. Launch Teamviewer for Remote on your Android and if required, download any appropriate Addon as instructed by TeamViewer. Let the Teamviewer for Remote continue running and proceed ahead to next step. Download & Install Teamviewer on your Windows Computer. Launch TeamViewer on your Windows Computer and use the Remote Control option to connect to your Android Device. Now assign a Keyboard Shortcut in Auto Clicker, Move Mouse Cursor to the appropriate location on your Android Device Screen using Teamviewer and let the Auto Clicker do the Clicking for you. Although the steps outlined above may seem like too much effort to get the Auto Clicker working for your Android Device, however after first time, you will find that the above procedure is really easy and simple to use. Yes this method has it’s own benefits of using the Auto Clicker on your Android Device. No need to find out how to Root your Android Device. This method of using Auto Clicker with Android works with almost all Android Mobile Phones, Tablets and other Android Powered Devices. Your Android’s Warranty remains intact as you do not need to modify your Android Operating System. This method allows you to Automate Tapping or Mouse Clicking at a single Location or even at Multiple Locations with a Windows Automation Software like Auto Mouse Click. Using Auto Clicker this way does not requires actual physical tapped multiple times. You can Automate Tapping, Dragging, Keyboard Typing or anything else easily and quickly. Rooting your Android Device for using Auto Clicker is not required now. Just follow the procedure outlined above and you are ready to use your Android Device to the fullest. Rooting your Android device can brick your Android Mobile or Tablet. Utilize the Auto Clicker, Internet Connection and the Teamviewer software to all work together and help you win the game, click cookies or anything else you want to be Automated on your Android.